Mindful drawing led by JJos – 5 minutes blind, 5 minutes blind, 5 minutes chair but don’t look at the paper. Be in the moment. Sculpture. 10 minutes and pass on. 10 minutes and pass on. 10 minutes and keep or pass on. 30 minutes make and display. Whooshing – 2 materials from wool, crayon, card tube and tissue; 5 minutes. Then 3 materials, 5 minutes. Finally 3 materials and a situation – on a chair, under the table, on the floor on the stairs. Photographic record – to be uploaded. 2nd March, at the lovely Missing Shoe. Two sets of 5 minute poses with our life model Jos, from every angle. A conversation about VWM’s future plans and our upcoming occupation of St Margaret’s Church of Art on St Benedict’s. Focus on an object from the intriguing Ponds collection, a reminder of the building’s life as a landmark Norwich shoe shop. Look hard. Then draw it (no looking). So good that one of us, Diane Grantham, has been accepted for the Norwich University of the Arts Fine Art degree. CONGRATULATIONS DIANE! Planning for our exhibition at St Margarets Church of Art in Norwich 13 – 20th March is gathering pace. We spent this morning writing catalogue entries for people’s personal collections at the lovely The Missing Shoe cafe – thank you Missing Shoe! Mind and body day on Tuesday 15th March will begin with a warm up and interconnectivity movement session led by Tessa Kirkpatrick. Mindful Drawing with Jos Wickham will be followed by Dr Maureen Tilford on mental health and mindfulness. Sculpture workshop day on Wednesday 16th March will be run by a fantastic North Norfolk artist…..to be confirmed…. Next planning session Weds 17th Feb, meet 10.30 at St Margaret’s Church of Art on St Benedicts. We are thinking about collections for our exhibition at St Margaret’s Church of Art in March. Collections, hoard, clutter – what distinguishes one from anther? And can you make a straightforward link between external and internal stuff? Here’s information about Clearing your Life Inside and Out, a talk by Sue Baylis at The Norwich Wellbeing Centre, Wednesday 27th January 7pm. Posted on January 18, 2016 Leave a comment on De-cluttering? It was good to meet again after the Christmas break. Below are almost all the objects chosen to represent the winter break. There was a wish for snow and coldness, which led to the Hepworth (on loan) and the Sugimoto photos. And a desire to enjoy beauty. We only had time to hear about two choices because we went to see the Magnificent Obsessions show of artists’ collections. When does hoarding become collecting, viz Warhol? How oppressive are things? What is it with taxidermy? Careful attention was paid to the exhibition design, in view of our upcoming show at St Margaret’s Church of Art. Did the strong colour of the walls work? How useful were the labels? Did the spaces make sense? How were Pae White’s Vera textiles fixed (magnets to wire)? No photos of Magnificent Obsessions, due to copyright restrictions. Sigh. Mother and Child. Henry Moore (1898-1986). England. 1932. Green Hornton stone, beads. h. 91.4 cm. Acquired 1933. Robert and Lisa Sainsbury Collection. UEA 82. © The Henry Moore Foundation. The image must not be reproduced or altered without prior consent from the Henry Moore Foundation. Large flat form. Claudia Casanovas. England. 1989. Stoneware and mixed clays. h 107 x w 53 x d 32 cm. Acquired 1990. Robert and Lisa Sainsbury Collection. UEA 1002. Artist and Galerie Besson. These links are to things we’ve talked about for trips, training, workshops…. A session of making at Sweet Arts, where people reflected on their experience of VWM so far, was rounded off with our Christmas party. We said goodbye to Veronica, who is leaving the Sainsbury Centre for new adventures in Kings Lynn, and welcomed Mel who will be joining us from Sweet Arts while Toni is off. Ideas flowed about workshops and visits coming up. Workshop favourites look like glass, willow, metal, creative writing and photography… somehow we’ve got to choose! When we meet again on 6th January at the Sainsbury Centre we will look at the Magnificent Obsessions show. And the session at the Sainsbury Centre after that, the Alphonse Mucha exhibition. Coming up are exhibitions about Giacommetti (April 2016) and Fiji (October 2016). Longer term there is going to be a John Davies show, the first for many years. Tate Modern is the favourite for a trip. Yorkshire Sculpture Park got the thumbs up from some, and the Fitzwilliam was another mention. But YSP is too far for a day trip and Kettle’s Yard is closed for refurb so that makes Cambridge less appealing. Tate Modern extension is opening on 17th June, so maybe after that might be extra interesting. Check the Time Out clip. There are some great shows at Tate Britain too; here’s Jo Spence for instance. We might have a training trip to Yorkshire Sculpture Park for people who are interested in learning more about arts and health practice. Our main event after the break will be our exhibition at St Margarets on St Benedicts St from 13th – 20th March. Are you inspired by the idea of artists as collectors? What do you collect? Why? How do you display your collections? Can you share what you’ve got with others? Or perhaps you hate collecting and prefer disposing of stuff? Lots to think about and do in 2016. 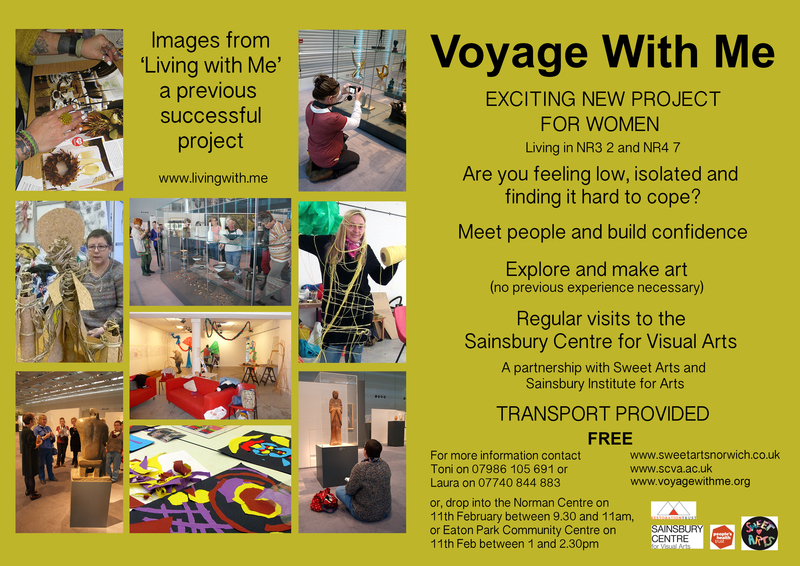 Very best wishes to everyone in Voyage With Me, and Im looking forward to seeing you at the Sainsbury Centre on 6th January. A drop-in session at Eaton Park Community Centre, where we used this object as the starting point for everyone’s making. Word association maps took people to different places, though materials were restricted. Eyes, a totem pole with eyes. Fabric with wire threaded through. Beautiful, powerful, crafted pieces in a busy, rather fragmentary session, the penultimate one before our Xmas break. More transformations, in the vast space of the Activity Hub at the Norman Centre, Norwich NR3. Sainsbury Centre objects represented on laminated A3 images for inspiration, materials aluminium foil, wire, string, lining paper, masking tape, charcoal and chalk. Choose an object to focus on; create a word association diagram; pick a word; in 5 minutes make something from 3 materials; have it photographed; three 5-minute makings. Pick a word; in 45 minutes make something from 3 materials; have it photographed; show and tell.